Is it possible that as homeschool parents we’re overloading our kids? 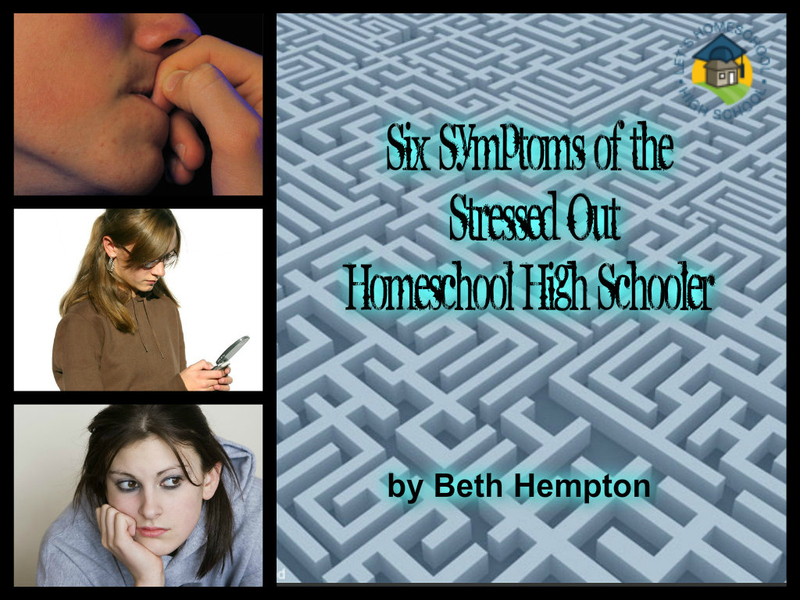 This year I have observed a phenomena that is becoming more and more present in homeschooling…stressed out high school students. I see it in their faces and in their work, and even hear it in their words. Some of our children are feeling the impact of too many outside activities, too many classes and just too much going on. I’ve never had more students express to me that they just feel stressed out and overloaded. I even had an elementary student share with me the other day that he was exhausted from running from activity to activity. When I told him to share that with his mom, he just sighed. I know that when my daughter, Ally, now 25, was in high school, we ran around like crazy, continually participating in homeschool activities, sports and church events. Ally thrived on it and although she had occasional moments of wanting to sleep in, she excelled in her academics and truly enjoyed herself. On the other hand, my son, JP, who is now 19, felt easily overwhelmed by not being home enough. He found comfort in home life and enjoyed the laid back homeschool schedule. If he didn’t have unscheduled time, he became irritable. Even now, in college, he pushes against overscheduling, requiring “off” hours to play music and be with friends. Obviously, I have raised two very different children and responding to their unique needs wasn’t always easy or clear for me. I am a major overachiever, so JP had to work hard to get me to recognize his need for down time. Regularly staying up late to get school work completed because there’s not enough time to do so during the daylight hours. Continual fatigue…never seeming well rested. Changes in grades or work ethic…often bright students will start turning assignments in late or incomplete almost as a plea for someone to notice their frustration. For students who already struggle, overscheduling can bring them down completely. Irregular emotional outbursts…seemingly unwarranted anger at siblings or parents, tears at an unusual time, etc. We have so much freedom and so many opportunities in homeschooling that sometimes we feel like we just can’t pass them up. But we also have the ability to allow our children to be children, and we don’t want to miss out on that. I remember when homeschoolers were recognized for their ability to be flexible enough to jump into “teachable moments” because we weren’t so scheduled. I wish that for each you! I love my students and some of them take three of my classes at a time without flinching while others struggle to squeeze one course into their busy lives. While we all go through periods where we feel stressed out by our obligations, if you see your high schooler exhibiting signs of stress for more than a couple of weeks, maybe you should look at the weight they’re carrying. High school is a precious time for our children…we want them to remember it with joy. While some children need pushing to get through the challenges of high school, others just need time to revel in not having to be somewhere or do something. God bless you as you balance it all, homeschool Mom! Beth Hempton, owner of Classes by Beth, teaches homeschoolers full time now that she has graduated both of her children from homeschooling. She and her chef husband live on Johns Island, SC, enjoying a bit of rural life while assist she assists him with his food ministry and personal chef company. Working in their community garden, and writing rounds out most of her time.